​Nibley festival goers helping to truly transform lives, in the village of Komende in Sierra Leone, in partnership with Rory’s Well. 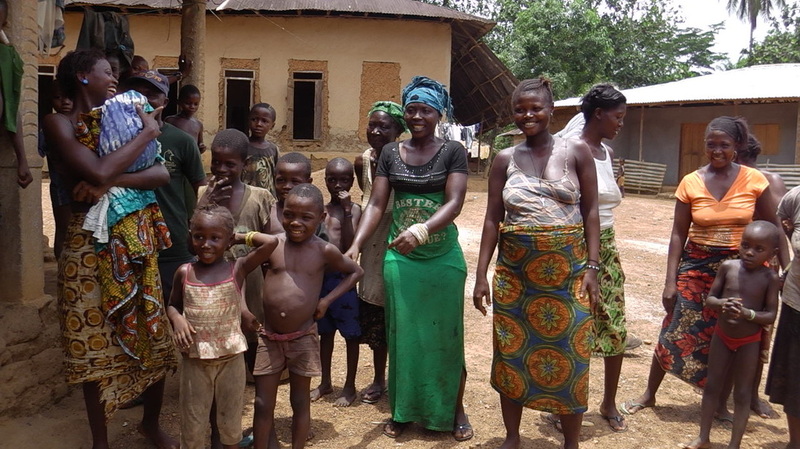 Rory’s Well has been working in rural Sierra Leone for over 2 years focussing on the basics of life : clean water, food, health and livelihood and has identified Komende as a village in need that will be the focus of the fund raising at the Nibley festival. Nibley and Komende are both small rural communities full of lovely people that like to sing and dance. We hope it will be a great way for people in North Nibley and festival goers to really connect to the impact they will personally make to the lives of people in one of the poorest countries in the world. Komende is in Pujehun in the South East of Sierra Leone and literally at the end of the road and borders the beautiful Gola national Park, very much like our Area of Outstanding natural Beauty. It is half a day’s walk to the nearest town (Potoru). 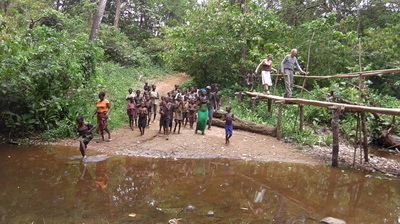 The village is only accessible by wading through the stream or clambering over the rickety bamboo bridge when the water is high in the wet season. The population is around 300 and they have absolutely nothing in terms of what we would consider life’s essentials. No water, no electric, no money, no medical facilities, no school but live dignified lives working on the land. This takes it’s toll on their lives and especially the health of their children. Many of the children die before their 5th birthday. 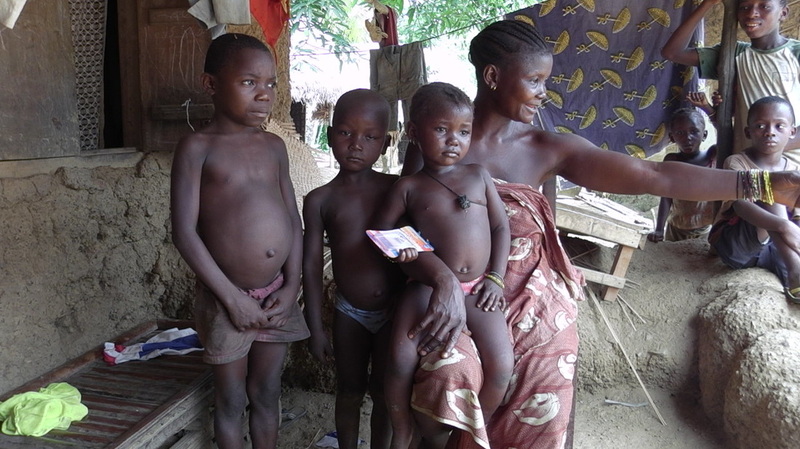 Malaria, respiratory and diarrhoeal diseases are the 3 leading causes of the country’s under 5 mortality. Malnutrition, which is directly affected by diet and repeated bouts of intestinal infection and diarrhoea, also accounts for 46% of child deaths. On our recent trip in April 2016 we visited Komende and met Shiku and his family. 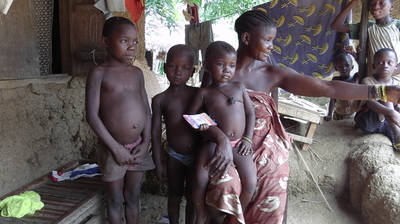 Shiku is 5 and suffers from Kashiorkor giving him a pot belly caused by an unbalanced diet. He only eats carbohydrates with little protein or variety for minerals and vitamins and no sweets!! Kashiorkor is reversible if treated early, by an improved diet, but very serious and potentially fatal if left. Shiku is the main water carrier for his family and does 6 trips a day with a 10kg bucket on his head from the stream to his house which is about the distance from Nibley Church to the Post Office, 3 trips before breakfast!! 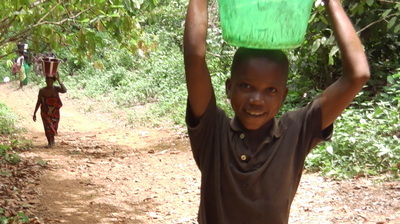 Shiku’s story is on Roryswell.org. To help these communities Rory’s Well has piloted a village development programme that we saw working really well during our April 2016 visit. In partnership with the community and local partners we establish a Village Committee and provide a well initially. 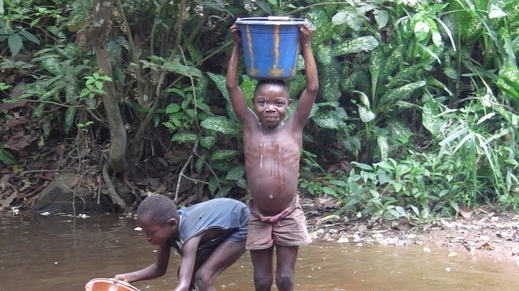 Clean water is the first essential to health, we then work with the village on rebuilding the kind of community swamp rice planting that was prevalent before the war, that was replaced by individual families planting on forest land they slash and burn. We provide just the essentials: organic local seeds, tools, drying tarpaulins and materials to build a secure store that can’t be found locally and leave the rest to the community. It is really heavy work clearing and planting in swamps that have been disused for years, we last about 10 minutes when we had a go but the villagers do it all day often with their children on their backs. This becomes a sustainable source of food for the whole village as seeds are held back for all families to use for individual and communal planting in subsequent years. With clean water, a staple food source secured and the community working together we then branch out, guided by the Village Committee into other projects eg installing latrines, planting ground nuts for protein, goats for women’s livelihood and manure, village gardens and education on health, nutrition, sustainable agriculture and livelihood. This gives a real leg up, rather than a hand out and helps people help themselves and we have seen a huge difference in the health and well being of the communities with these small interventions. We keep in touch with progress through Stephen, our man on the ground who has a phone and bike so we see frequent progress updates and ensure the money is being used on the ground as intended. Trustees check on projects 2 or 3 times a year in person and would love people to come out and see Komende for themselves. There’s 3 rooms in our family guest house in the neighbouring village. All you’d need is a sense of adventure and travel expenses as everyone (including Trustees) pays for their own visits so all donations go to projects and people in Sierra Leone rather than overheads!! We’ll be checking in with Komende regularly and I know they will be sending a sweet song and dance by way of a big thank-you to all the festival goers and people of Nibley. Click the image to visit the Nibley Festival Website!